The plantations in the valley of Hile, in Nepal, were established recently. The oldest garden among Kuwapani, Guranse and Jun Chiyabari was created not much more than ten years ago. 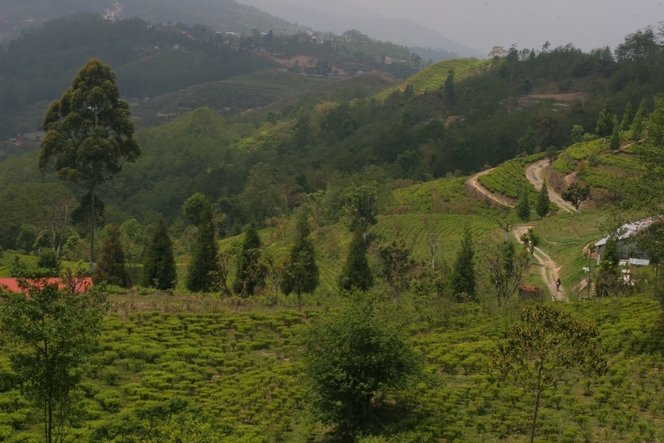 This might in part explain the quality of their tea, because the bushes they chose to plant on these mountain slopes are recent cultivars, famous for their aromatic properties. In addition, each of these plantations has developed innovative techniques for rolling the leaves, which is unusual in Nepal and India. These three plantations are also special in that they are situated right next to each other. In this photo I took of Kuwapani, you can admire its splendid views, of course, but you can also see the red roof of the Guranse factory, close by. Some regions produce their best teas during the period from March to May. So this is a good time to meet the farmers and planters and see them at work….